Altamonte Springs, Florida, USA, March 1, 2016 – EIZO today announced the Re/Vue Pro compact lossless encoding and streaming solution for mission-critical applications. Designed for air traffic control (ATC) system integrators and recording solution providers, the new device is equipped with a DisplayPort digital interface to support higher stream resolutions of up to 4K x 2K. The Re/Vue Pro supports both DVI and DisplayPort connectivity and offers lossless capture and streaming of resolutions of 4096 x 2160 at 60 Hz via DisplayPort and up to 2048 x 2160 at 60 Hz via DVI. Industry-leading compression ratios of 8,000:1 to 30,000:1 minimize required storage for large volume image data. Mission-critical redundancy is provided by dual Ethernet outputs and two external power supplies. Fully detailed APIs including playback decoding and streaming are provided together with full Simple Network Management Protocol (SNMP) interface details to support remote configuration and diagnostic monitoring of connected Re/Vue devices. 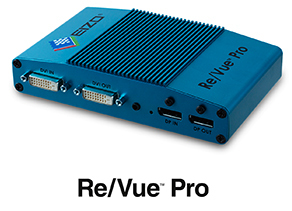 Re/Vue Pro joins EIZO’s line-up of screen capture, encoding and streaming technology to enable ATM/ATC system integrators to deploy industry-leading video, audio, and data recording systems. Re/Vue products are ideal for typical requirements of mission-critical recording in live ATC operational centers, training and simulation, and R&D applications. EIZO will be demonstrating the Re/Vue Pro at World ATM Congress 2016 in Madrid, Spain from March 8-10. Visit booth #349 to see the new product along with EIZO’s full line of ATC visual display solutions.